While the handlers of NASA's venerable Voyager 1 spacecraft are still waiting for it to depart the solar system, a new study argues that the probe actually popped free into interstellar space last year. Voyager 1 left the sun's sphere of influence on July 27, 2012, according to the study, which employs a new model to explain and interpret the probe's data. The new model is different from NASA's take, which suggests Voyager 1 remains within the solar system, though just barely. This artist's concept shows plasma flows around NASA's Voyager 1 spacecraft as it gets close to entering interstellar space. The orange arrow shows the direction of the solar wind. Image released Dec. 3, 2012. Swisdak and co-authors James Drake and Merav Opher — of the University of Maryland and Boston University, respectively — are not Voyager mission scientists. Their findings contrast with recent papers by the mission team and other researchers, which have concluded that the spacecraft is likely plying a strange transition zone at the edge of the solar system. Voyager 1 and its twin, Voyager 2, launched a few weeks apart in 1977 to study Saturn, Jupiter, Uranus and Neptune. The duo completed this "grand tour" and then kept right on flying toward interstellar space. Voyager 1 will get there first. It's about 11.6 billion miles (18.7 billion kilometers) from Earth, making it the farthest-flung manmade object in the universe. Voyager 2, for its part, is now 9.4 billion miles (15.2 billion km) from home. Both spacecraft are exploring the outer layers of the heliosphere, the huge bubble of charged particles and magnetic fields emanating from the sun. But things are really getting interesting for Voyager 1; it has detected a dramatic drop in solar particles and a simultaneous jump in high-energy galactic cosmic rays, which originate from outside the solar system. But Swisdak and his colleagues present a different view in a paper published online today (Aug. 15) in The Astrophysical Journal Letters. They devised a new model, which envisions the heliosphere boundary not as a relatively homogeneous surface but rather as a porous and multilayered structure. Magnetic reconnection — the breaking and rejoining of field lines — creates a complex set of nested "magnetic islands" in the solar system's outer reaches, allowing the mixing of interstellar and solar material near the heliosphere's edge, the researchers say. This model provides a better explanation of Voyager 1's data, Swisdak and his team say, and it suggests that the probe cruised into interstellar space on July 27, 2012. 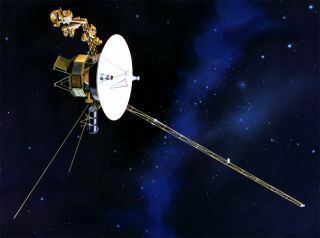 Voyager mission chief scientist Ed Stone, a physicist at the California Institute of Technology in Pasadena, said he and his team will keep the new model in mind as they continue to study the data Voyager 1 beams home. "Their model would mean that the interstellar magnetic field direction is the same as that which originates from our sun," Stone said in statement released by NASA today. "Other models envision the interstellar magnetic field draped around our solar bubble and predict that the direction of the interstellar magnetic field is different from the solar magnetic field inside. By that interpretation, Voyager 1 would still be inside our solar bubble." "The fine-scale magnetic connection model will become part of the discussion among scientists as they try to reconcile what may be happening on a fine scale with what happens on a larger scale," Stone added. "The Voyager 1 spacecraft is exploring a region no spacecraft has ever been to before. We will continue to look for any further developments over the coming months and years as Voyager explores an uncharted frontier."